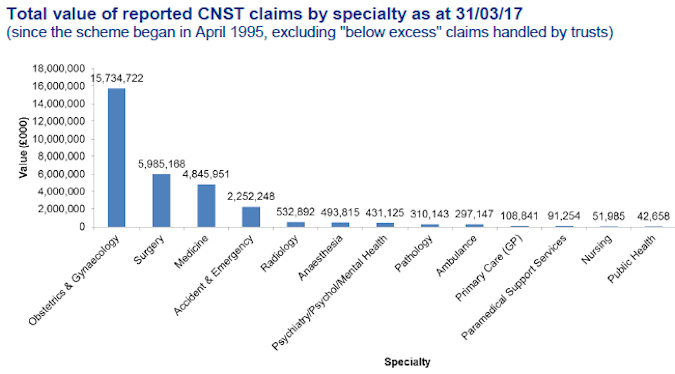 March 21, 2018 -- Claims in which allegations of negligence are made against radiologists are uncommon but sadly not unknown. To the end of the year 2016 to 2017 in England, 2,922 claims involving radiology have been reported to National Health Service (NHS) Resolution since the commencement of its risk pooling scheme in 1995, out of a total of 129,091 claims (2.26%). As can be seen in the table below, this relatively small number of claims has a total value of over 532 million pounds (607.8 million euros). While dwarfed by other specialties, this is a figure not to be easily dismissed. This article considers the types of claims faced by radiologists and how they can best be avoided. CNST stands for Clinical Negligence Scheme for Trusts. Ref NHS Litigation Authority Fact sheet 3 information on Claims 2016-17. To assist, NHS Resolution Panel Firm Bevan Brittan has reviewed the claims it handled in the last five years in which allegations of negligence have made against radiologists. It found around 70% of claims for compensation involved alleged failures to identify a condition, with cancer predictably being at the top of the list, and bone conditions and intestinal disease following behind. Claims can also be made when there has been a lack of escalation or poor safety netting after imaging, with scan reports not being communicated to the clinical team with the appropriate urgency, or in some rare cases going missing entirely. For claims to be successful, patients have to demonstrate they have been caused injury as a result of a radiologist's conduct. So what happens when allegations are made? In most cases, a patient will instruct solicitors who will write to the radiologist's trust (aka, hospital group), or if treatment was provided privately, to the practitioner personally, with details of the claim in a formal Letter of Claim. The defendant trust or the practitioner will then have four months to respond, which allows time to report to NHS Resolution or a defense organization that will then usually investigate by instructing its panel solicitors to obtain a report from an expert witness and seeking the input of the clinicians involved. If evidence suggests the radiologist's management fell below a standard, which a body of radiology opinion would deem reasonable, then it will be admitted the radiologist involved breached his or her duty of care to the patient. If it is accepted, the claimant has suffered injury as a result of the breach, for example, if a condition was not diagnosed because of reporting errors and the patient's condition worsened as a result, then damages will be decided, usually in negotiation. If a claim is denied or damages cannot be agreed upon, the patient will have a choice whether to proceed by issuing the claim at court and proceeding through a set process to a trial where the issue in dispute will be decided by a judge. Naturally, there can be disagreement as to what constitutes reasonable management, but clear, accurate reporting is key to defending claims. If the only evidence to go on is a brief report, with little indication of the detail, it can be difficult to demonstrate to a judge that the care provided was of a reasonable standard, even if a clinician's account of his or her reporting process is compelling. Patient A: This patient underwent spinal imaging to investigate pain and problems in her lower limbs. The imaging request specifically referred to a suspicion of an abnormality of the cord, yet MRI signs of spinal cord herniation at the T5 level with focal anterior displacement of the cord were not referred to in the consultant's report, and no follow-up was recommended, leading to a delay in diagnosis and treatment by the clinical team. The expert witness in this claim commented that even though he would not necessarily expect the rare condition of herniation to have been precisely identified, focal deviation of the cord should have been mentioned in the report, which would then have led to investigation and diagnosis. Patient B: This patient attended for a CT scan after cataract surgery failed to address deteriorating eyesight in his right eye. Imaging revealed a large pituitary tumor, but the imaging department failed to escalate the report, and no further action was taken by the clinical team. It was only after deteriorating vision in the left eye led to a further MRI scan over a year later that the pituitary tumor was identified and excised. By this time, it was larger and its removal was far more problematic for the patient. Patient C: In this case, an x-ray was requested for a patient to look for the cause of enlarged lymph nodes and back pain. The reporting consultant reported no obvious diagnostic abnormality but noted reduction to vertebral height for which he recommended MRI, although not on any urgent basis. The patient's condition deteriorated to paraparesis before MRI was undertaken three months later. This revealed widespread marrow replacement by tumor in most of the visible skeleton. In this claim, the expert witness was critical of the reporting consultant for failing to identify an erosive and destructive process involving the spine, which he felt that most radiologists would have identified. He also considered it a breach of duty that definite change from previous spinal imaging had not been noted. The expert was also critical of the failure to expedite MRI. It was admitted that had the radiographs been reported appropriately, the deterioration to paraparesis could have been prevented. In these cases, admissions of negligence had to be made, and damages were paid to the patients reflecting pain, suffering, and loss of amenity (otherwise known as general damages), as well as for financial losses incurred as a result, such as loss of earnings due to an inability to work, private medical treatment, the cost of any care provided to them, and aids and equipment purchased (special damages). Damage payments can vary enormously depending upon the age and condition of the patient and the extent of damage deemed to have been caused, but, on average, settlement value per patient is in excess of 40,000 pounds (46,000 euros), with some claims settling for as little as 2,500 pounds (2,900 euros) and others settling for hundreds of thousands, if not millions of pounds. Solicitors' costs also can be high with both sides incurring substantial costs between a claim being raised and subsequently settled or determined at trial, often due to the cost of expert evidence. The average time to settle a claim at around the 40,000 pound (46,000 euro) mark takes from initiation to conclusion just under two years. So what can a radiologist do to minimize the risk of his/her involvement being the subject of a claim? First, review the clinical request for imaging in detail to fully consider the clinical picture. Second, record as much detail as possible in the report. Noting what you do not see can be as important as noting what you do. If you see something odd, inexplicable, or inconsistent, even if it is unrelated to the clinical request, mention it. Third, record your recommendations for follow-up and immediately escalate any concerns to the treating team to ensure patients get the care they need. Alison Garrett and Joanna Lloyd are with Bevan Brittan LLP, lawyers for the public, private, and third sectors.